"We are Youth, We save lives"
Youth For Blood was established after a real event that took place with two college students named Saroj Karki and his friend Jogendra Urau. On the night of 27 May 2011, Jogendra Urau was in need of blood for his maternal uncle. His uncle was suffering from tuberculosis. He tried his best to manage blood for his uncle but couldn’t succeed. He then made a call to his colleague Saroj Karki and asked for some help. Saroj made many attempts to manage blood ora blood donor but he too was unsuccessful. After so many efforts, on next day,while Mr. Karki was travelling to his office, he met one of his colleagues named Dashrath Shah. After greeting each other, Saroj asked him about his blood group. In reply, Mr. Shah said he belongs to the same group that Joginder’s Uncle needed.On next day,while Mr. Karki was travelling to his office, he met one of his colleagues named Dashrath Shah. After greeting each other, Saroj asked him about his blood group. In reply, Mr. Shah said he belongs to the same group that Joginder’s Uncle needed. Next day while Dashrath Shah was on his way to office, Saroj met him. Saroj Karki described the entire situation to him. Dashrath Shah, considering the sensitivity of the situation agreed to donate blood. Sooner Dashrath Shah donated blood. This was the first successful coordination of Youth For Blood but yet YFB was not officially registered. After managing blood for his friend’s uncle, Saroj Karki felt a need an organization that hel. He realized that this could be one of the ways to serve the society and felt this must be made a campaign. This self-satisfaction and a will-power to serve the society kept the foundation of Youth For Blood. 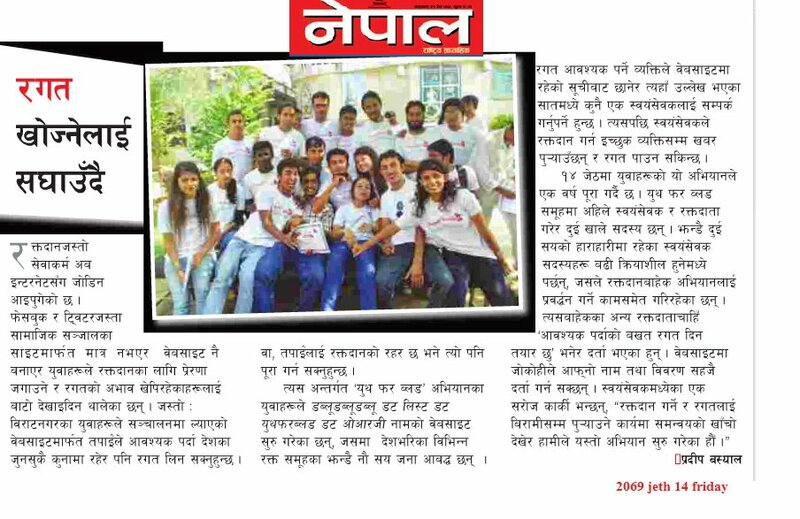 Finally, Mr. Karki launched a Facebook page named Youth For Blood and started to facilitate blood for other needy people with the help of social media. The page helped to conduct online facilitation of blood till the registration of Youth For Blood. After one month of single efforts, Karki shared this campaign in a group of sixty colleagues and asked to join him but only four colleagues in the group positively responded. After that, with a great courage and determination they actively continued the campaign. They started meeting regularly and also tried to persuade and influence other circle to come and join them. And sooner to a surprise to all, a young energetic service motive team full of determination, dedication formed. Due to the lack of resources, they held their meetings at different public places of Biratnagar like Aarohan Gurukul (a Theatre), Paropakar Ghat (a Graveyard), Shahid Rangasala (a Stadium), etc. Finally, at last they succeed to register themselves as a legal social organization with Ad hoc President Nirmal Sharma.